STS has successfully executed more than 60 automatic tank cleaning projects using the Blabo® system and highly specialised technical staff. The process has been successfully performed in different tank types. 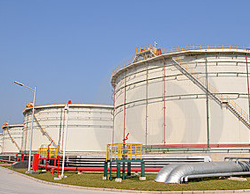 This process is carried out with the tank closed using mobile and built-in plants. We combine the automatic cleaning of the tank with the recovery of hydrocarbons, thus reducing the execution times, storage capacity losses and cleaning costs. Safer operations by reducing the entry of staff to confined spaces, minimising contact with hydrocarbons and staff exposure to hazardous atmospheres. This process considerably reduces the waste produced, minimises the consumption of resources as well as the emissions of substances which are hazardous for the atmosphere and the pollution of land and water. STS uses BLABO ® System technology. This is an automated, mobile and modular system which enables cleaning the tanks in a closed circuit thus minimising entering inside with a high percentage of hydrocarbon recovery and is applicable both to tanks with a floating or fixed roof which contain crude oil, slops, fuel, etc. These characteristics offer advantages for safety and the environment, reduce execution deadlines and the costs for the customer compared to traditional manual cleaning procedures. STS has undertaken the Chemical Cleaning activity since 2004, with a wide range of real and effective applications which have been tried and tested by the experience gathered over the years in different refineries in Spain, Portugal, the UK and the rest of Spain. For years our services have been applied to a crude oil preheating exchange unit, crude oil distillation columns, vacuum column and pump-arounds, vacuum exchange unit, desalters, Visbreaker fractionator and soaker, Visbreaker exchange unit etc. BLABO ® System uses available state-of-the-art technology to considerably reduce execution times, guarantee safety in the cleaning process and achieve a high percentage of hydrocarbon recovery. This significantly reduces costs compared to other processes. The automation of the cleaning process with BLABO ® System means that the physical presence of technicians inside the tanks is no longer required, thus increasing safety and reducing the possibility of accidents to a minimum. From STS Tank Cleaning we opt for environmental sustainability. The high percentage of hydrocarbon recovery, of almost 100%, makes our cleaning system effective, efficient and environmentally friendly all at the same time.